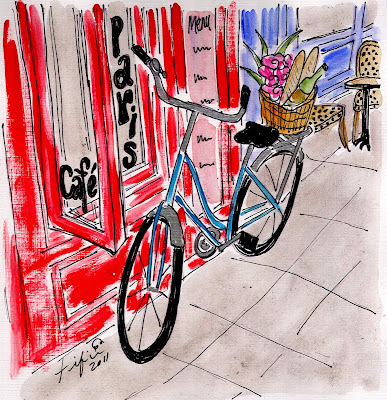 LOVE painting bicycles... Paris... cafés... oooh la la!!! This painting is AVAILABLE for purchase via My Shop... the ORIGINAL PAINTING or SIGNED PRINT! Tomorrow... MORE Paris outdoors... see you then! Ooh-la-la is right, Fifi. I keep on saying this, but you are so talented. My goodness. Lovely! Lovely, lovely, lovely! I would love to be riding that bicycle with the delicious cargo home... in France... ahhh. Thank you, Fifi for your beautiful and happy creations! Happy New Year, and happy painting! I too feel like a broken record at times, but you are talented and this is a lovely painting. :)Bicycles are hard to paint and come out looking as good as yours do. Just beautiful! Happy New Year, Bonne Annee, I was crazy busy over the holidays but am back making the rounds ~ Good luck on your painting a day venture, what a great way to start off the year! I just love this painting. My husband and I had an old bicycle with a basket full of flowers parked outside of our church with a little sign that said "Just Married" the day of our wedding. I've always loved pictures with bicycles and baskets, especially parked in France! I hope all is well with you! Your paintings are always so splendid!